Here it is, my 500th blog post here on Provoking Beauty. Before I announce the winner, I thought I would share what I think is in store for this blog in the months ahead. Maybe next time I should have that piece of art finished so folks might be inclined to enter. The goal is to get the two pieces done this weekend, but first I have to go cook a Thanksgiving feast! I won! I won!! I never win anything so whatever it took, I don't care. I won!!! Congratulations on the 500th post. I've enjoyed them. 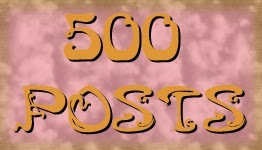 Congrats on your 500th post! And the Magnificat is one of my favorite prayers, so I'd be happy to participate, if you'll have me.